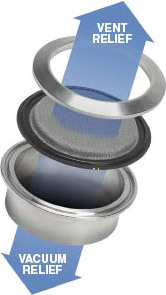 The Rubber Fab V2B Gasket offers an additional answer for vacuum and pressure relief for pharmaceutical, food and beverage processing tank venting when airborne particulate removal is required. Using a 200 mesh screen combined with a 14 mesh screen of scintered construction, Rubber Fab has created a cost effective alternative to expensive vacuum breakers and venting systems. The V2B System is attached/connected using a standard sanitary clamp to a sanitary tank port, the same way a standard vacuum breaker in installed. Installation can be horizontal, vertical or in single or multiple port configurations (i.e. manifolds) without special fabrication or expensive tooling. The V2B screen will fit perfectly into the ID of a sanitary pipe and can be used for inflow fluid conditioning filtration. A key benefit of the V2B Gasket is it's prevention from most atmospheric and environmental contamination customarily found with other venting systems. Because the V2B Gasket can provide unrestricted air flow with ultra fine filtration, you can feel secure in knowing the hygenic condition of the tank contents remain protected. With regular cleaning and maintenance, the V2B Gasket is a cost effective and incredibly simple way to provide contaminate free air flow to any tank system.